Chitkara University Admission 2019: The Chitkara University will soon release the notification regarding the UG and the PG program for the session 2019-20. The university have the two campuses which are situated at Punjab and the Himachal Pradesh. The university doesn’t conduct any of the entrance exam. Candidates are able to get admission on the basis of the marks secured in 12th class. 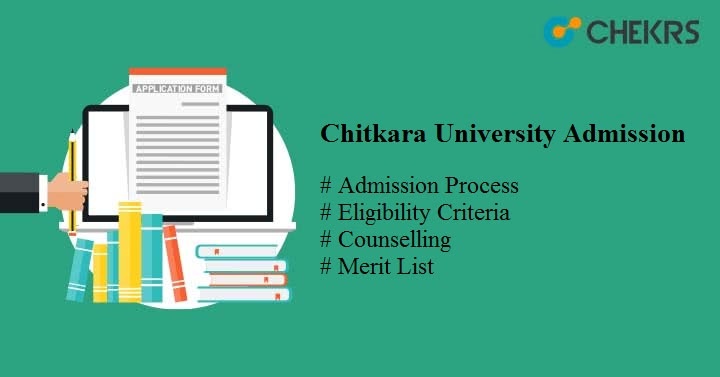 From this post, students are able to get the information regarding the Chitkara University 2019 Admission. Latest Update: Chitkara University Admission 2019 Procedure started from 21st January!! Visit the official Site from below link. The university offers the courses under the UG, PG and the Doctoral level. Candidates are able to get the full information regarding the application form, important dates, eligibility criteria, application fee etc. Students can check the whole information regarding the Chitkara University Admission Process. Pass 10+2 from the recognized board with the 60 % aggregate from the PCM stream. Pass 10+2 with secure at least 50% marks under which the English and the Mathematics subject are compulsory. NATA 2019 sore will also be considered. We are mentioning here some of the important points regarding the Chitkara University Admission Form. Candidates can read it carefully before filling the application form. The steps are given below. Candidates can also get the admission form, from the various the bookshop which is mentioned on the website. After the announcement of the academic session, the registration for the admission is started. Candidates need to submit the application form along with the required document in the enclosed self-address envelope. The Chitkara University Admission Process will be followed by the university by receiving the applications and the seat allotment at the time of counselling. The whole admission process is based on the marks scored by the candidates in any of the national exam and their academics. A separate merit list is prepared by the university regarding the admission after the application received by the university. All the candidates need to participate in the counselling to get admission university. As per the no. of the application form received by the university the merit list is prepared. Those candidates who apply through the JEE Mains 2019, NATA and any other national level exams then there will be separate merit list prepared by the university. Each and every student need to check the Chitkara University Merit List as it contains the name of the shortlisted candidates. After the merit list is provided by the university, the counselling is started. All those candidates who are shortlisted were allotted the seats on the basis of the rank and score card obtained by them. On the day of the Chitkara University 2019 Counselling candidates need to bring the original document. Candidates were allotted the final seats after the submission of the counselling fees. After the seat allotment is done through the counselling process candidates needs to report to the authority of the university for the admission. While reporting to the allotted campus, candidates should have their allotment letter. Candidates need to carry the original certificate to submit them at the university. This is the final process of the Chitkara University 2019 Admission. Hope the details given here will help the candidates to get the information regarding the Chitkara University Admission if there are any queries please mention it through the comment box given below. We will give the answer to your queries.